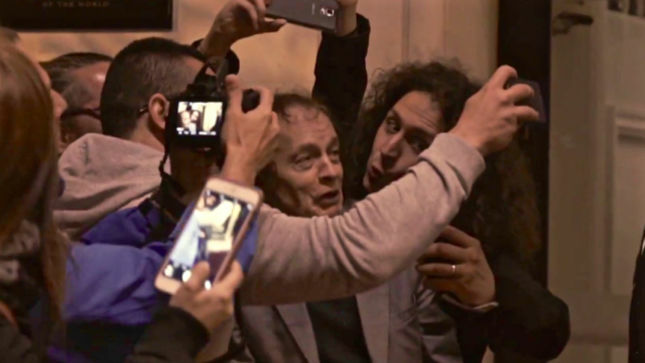 Following AC/DC’s May 10 performance in Seville, Spain, guitarist Angus Young took a moment to meet with fans and sign some autographs, and the group are sharing footage from the city and the concert event. The show at Estadio de La Cartuja marked the band’s second concert with Axl Rose on the European leg of the Rock Or Bust tour following a May 7 debut on opening night in Lisbon, Portugal. Rose has stepped in to assist the band in Brian Johnson’s absence due to the singer’s deteriorating hearing. The inventor of in-ear monitors, Asius Technologies founder Stephen Ambrose, confirmed that he will meet with Johnson next week to review the latest upgrade to the technology that may help the rocker return to the live stage one day. “Happily, due to everyone's tremendous support, Brian and I spoke yesterday!,” posted Ambrose. “What a gracious man; He and his wife Brenda invited me to visit them next week. If anyone deserves to benefit from my research - it's Brian - who has been giving incomparable performances for years despite increasing hearing loss. Rose is on board for AC/DC’s 12-date European run and is expected to rejoin the band sometime later this year for the to-be-rescheduled US Rock Or Bust dates.